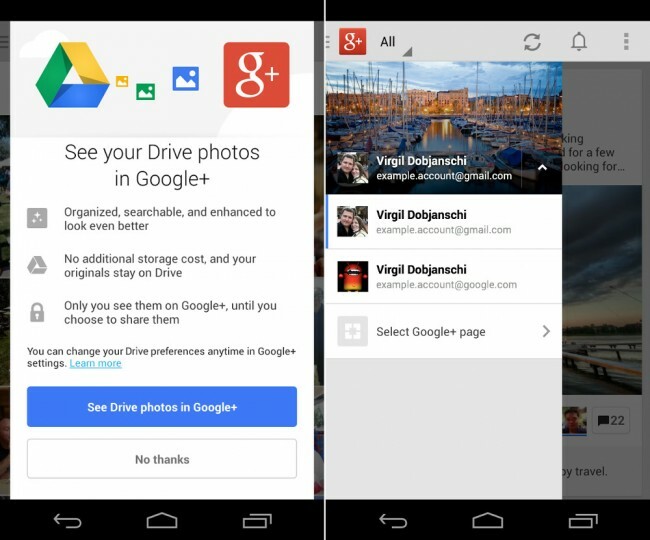 A new Google+ update to version 4.1 was announced this morning by G+ developer Virgil Dobjanschi. The update is a good one, as it includes new way to switch between accounts that isn’t such a pain in the a**. No more of that signing in and out of account, stuff. You’ll also find access to Google Drive photos and videos through G+, with Drive photos getting enhanced and “awesome’d” automatically, just like your other photos. On a semi-technical front, the new Google+ app you’ll find fully supported Google Apps for Business features, more controls in the location sharing settings, and will notice that Messenger has gone away for good in favor of Hangouts. But you knew that was coming. Oh, pull-to-refresh is in there as well. Again, it’s a big update. Build 4.1 should start rolling out as early as today, but with everyone’s favorite staged rollout process in play, you may not see it for a while.